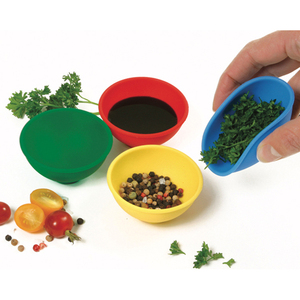 Ideal for staging ingredients or serving condiments. Pinch to funnel. Won't retain odor or lose shape. Each bowl measures, 1.5"/4cm height by 2.5"/6cm diameter. Capacity, each bowl can hold 1.75oz/50ml. Heat resistant to 500F/260C. Set has 4 colors, blue, red, yellow and green. FDA approved. Microwave and dishwasher safe.